On its website, Enox describes the Safe-KID-One as a tool for parents. The watches have a simple, colorful design that seems appealing to children. The device has a built-in microphone and speaker to permit two-way communication. 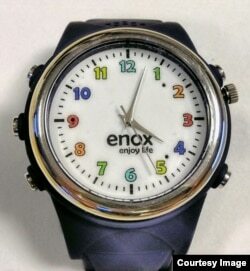 The Enox website says children wearing the watch can place a telephone call with just one touch of a number. The site claims that “only pre-listed parties” can call a child through the device. However, the European Commission (EC) recently reported that it found major security concerns with the Safe-KID-One system. The EC is the decision-making body of the European Union (EU). The warning was made public through the EC’s “Rapid Alert System.” Commission members investigated the device after concerns were reported by officials in Iceland. The EC wrote that the risk level of the smartwatches was “serious” and called for an immediate recall of the devices. The warning said the app linked to the Safe-KID-One device can permit non-secure communications with the system’s computer server. The server’s security issues make it possible for people to break into the system and steal private information, the EC said. The European Commission said the privacy and security risks led to its decision to announce an immediate recall of the devices from EU members. EC officials said the Safe-KID-One was being sold on the internet. It is not the first time privacy and security concerns have been raised about smartwatches for children. ​In 2017, German officials banned some kinds of smartwatches. The government said the watches let parents secretly listen in to children and their environment. At the time, no specific smartwatches were named. Officials said the devices had microphones that let parents listen in on teachers and school activities. The government said the system violated German laws aimed at restricting surveillance. Also in 2017, a Norwegian Consumer Council report warned of the dangers of smartwatches for children. The group said it had uncovered serious security and privacy issues after examining and testing several smartwatch models being sold across Europe. The report said that in a few simple steps, a stranger could easily take control of the watches to be able to find, listen to and communicate with a child. At the time, the council said there was an urgent need for manufacturers to increase security of the systems or face forced recalls of the devices. I’m Bryan Lynn. And I’m Dorothy Gundy. What do you think about children using smartwatches? Write to us in the Comments section, and visit our Facebook page.